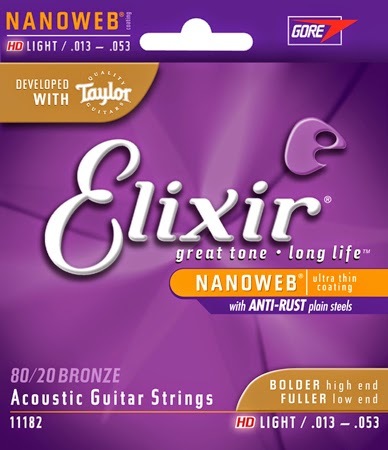 Elixir HD Light .013-.053 Acoustic Guitar strings review. As mentioned in one of my previous posts, I was greatly encouraged by Taylor's guys to restring my Taylor 312CE (which originally comes with those strings)with a set of Elixir HD .013-.053. So yesterday, during the weekly rehearsal with my acoustic band, I tried a set of Elixir HD, and this is my review. The first thing that I noticed is that they are super heavy. I regularly use Martin .011-.052 or Ernie Ball .12-.54 gauge strings, so I'm pretty accustomed to that kind of tension, but man, Elixir HD are like telegraph poles under my fingers! These strings require unusual strenght and effort to properly form and play bar chords (Bb, first fret is a nightmare), so at the end of the rehearsal, my left hand's fingers were very tired. I was in totally discomfort while playing songs like Amy Winehouse's Rehab and Alan Parsons Project's Eye in the sky. The second consideration is about my guitar's set up. My luthier has recently set up my Taylor while I was using .11-.52 strings. After installing the Elixir HD strings, I suspect that my neck needs attention again: the relief seems to be changed. Unplugged sound. Theoretically, hevier gauge = louder volume. Theory, and not always true. When strumming an open chords progeression in a typical pop rock tune, Elixir HD strings perform a good volume and a brilliant tone. But when it comes to softer tones, for instance during an easy fingerstyle part, well, my feeling is a bit different: the heavier gauge means also a stronger tension between the tuners and the saddle; the increased traction contributes to decrease the soundboard's ability to vibrate when the strings are plucked. As a consequence, the soundboard's ability to resonate is somehow affected and the output volume of the single strings is not as loud as expected . Plugged in sound. As some guys wrote some weeks ago on Unofficial Taylor Forum, these strings feature a lot of treble tones, which is not a bad thing, but you have to modify your equalization and tone to re create the balanced tone you were used to. After some attempts I managed to set my guitar's and amp's knobs and get a good, balanced, rich sound. Again, I had to re-calibrate my right hand's dynamic / strenght to emphasize or soften certain nots and chords, but the sound is satisfactory. Duration. Too early to say something. I decided to clean the strings every 2-3 songs and at the end of the session. I will post you with updates. I hope that these strings last more than their competitors. Price. A complete nonsense, specially in Italy. Prices are forbidden here but, you know, some parts of my rigs are cheaper than a set of Elixir. Pros: brilliant, rich sound, also after 2 hours playing with my infamous reverse Mida touch. Cons: too heavy for my playing style and (IMHO) for a guitar soundboard/top. Too much treble tone. Expensive and hard to find. Cheap packaging (D'Addario and Ernie Ball strings come in plastic envelopes which preserve metal from oxydation). Will buy them again? Probably not, but Taylor says: "use them", so I did.